Right now I'm back to being giddy. CW's note put a smile on my face. I'm happy that he realizes how important New Moon is to all of us. I think there has been no word yet on Taylor because Summit said it's up to the director. With his official announcement being today, I assume we can expect word on Taylor in the very near future. Alright kids - I'M BACK FOR GOOD! Anywho... I think that CW will be good for the movie. He's proven himself really good with human emotions in films. And he knows that special effects are good... but they can't make a movie (see: The Golden Compass). His letter was very reassuring. So we'll see where this goes from here! As for Taylor... hope to hear about that soon. And I swear, if they take him off I'm not seeing it. I know it hasnt been officially announced by Summit yet and maybe Taylor is still gonna play Jacob before the transformation in New Moon (and then evolve to Michael Copon??) but I found this!! If the link doesnt work, I print screened it here: http://img.photobucket.com/albums/v660/ ... EWJAKE.jpg . 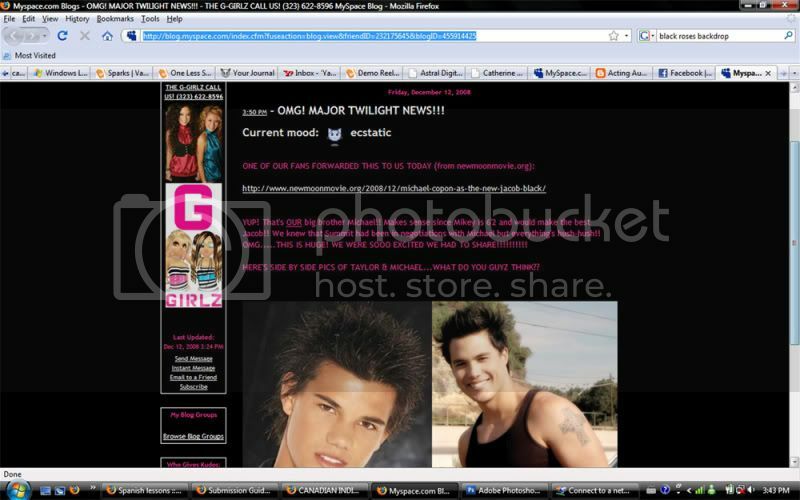 Its a blog of the Ggirlz and apparently they are really close with Michael Copon who as we all know, has been rumored as the new Jacob Black for days now. He has also written it down in his facebook that "Michael is the older Jacob Black" and the authenticity of his page has been proved. And now that blog just sealed it. I'll believe it when it's from Summit... til then, Team Taylor! AGHH!!! This Michael guy is NOT JACOB!!! ^i think taylor fans should start preparing. taylor is out. it's more or less final. but oh well, we can still wait for the offical. I am not sure that Summit would have said in interivews "they aren't sure about taylor" just to say, "oh he'll be in new moon" there's definetly something going on and for me it concludes that taylor is out. besides if it was jut a rumour, summit would have confirmed it to relieve the fans. but i am not sure that's that's the case. so are some people honestly not going to see new moon and eclipse just because taylor isn't in it? i will be waiting to see that. i think we'll have the rob effect again. oh well. i already like who ever they cast even if i don't know who it is. and Chris Weitz is amazing. I love that he has good experience. Humaneclipse - oh wow, thankyou for writing that. i've never scene the movie or read the books. i have seen the trailers and they look pretty promising. thanks for the information. I didn't think it went that way. but you're right. I feel like I am going to cry, this isn't fair. Taylor was excited to play the role, he was Jacob in the first film. I am a fan that liked him as Jacob, and am quite confused as to how they are going to convince fans that Taylor transformed into this huge burly guy, who I could never imagine as Jacob. Please don't flame me...But, I am really liking the Taylor to Micheal thing. To me Jacob was a beautiful, sweet, innocent, boy, with a smile like sunshine.... until the change. After that, he was a cocky, obnoxious, hot, butthead, MAN (whom I love to death....like a brother, lol - well, minus the whole hot thing, lol) He was a completely different person to me. He LOOKED like a completely different person in my head, while I read it. This is PERFECT for me. I do feel really bad for Taylor. I really hope he gets to play Jacob until the date at the movies. But, his career is still going to skyrocket because of Twilight. Like I said, Taylor looks older than 16 to me...I think he can pull it off! I was definitely prepared for the worst, if it's true that our dear Taylor is not coming back. S*** happens. I'll live and still see NM.